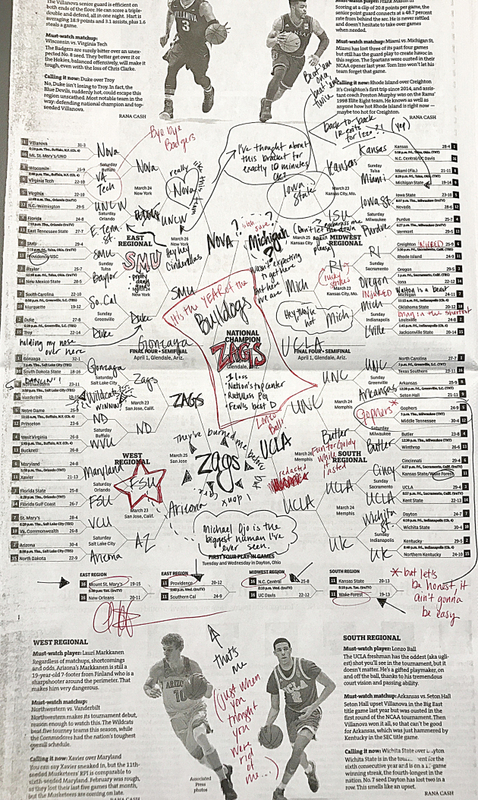 You should have seen Marcus’ face a few weeks ago when the subject of the Strib's annual hand-drawn “bracket picks” page came up. His expression wasn't "scared" or "stupid idea," it was more like: "You don't want me doin' that." Marcus Fuller knows basketball up, down and sideways. That part of his brain has grown so big that it has boxed out the “handwriting” section of his frontal lobe. Marcus’ scribbles on his notepad look like hurried baseball players’ autographs. Ys somehow look like Rs. It's really something. 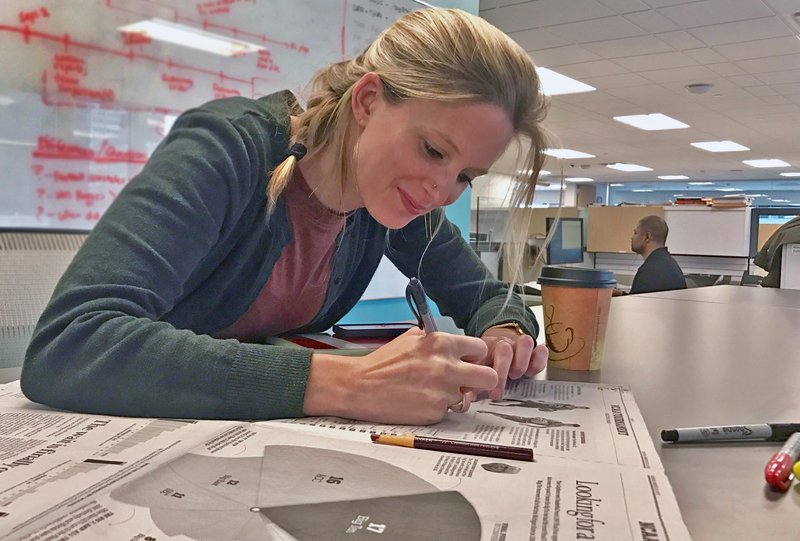 This being Marcus' first year with us on the beat, he carefully made sure a few weeks back that it was time for a new direction with the NCAA picks (and the results are in your morning paper, and here). So: Rest in peace, Hand-Drawn NCAA Tournament Picks page ... in print, at least. Our old pal Amelia Rayno, once the nation's top drawer of bracket picks, stopped by for a few minutes on Monday to hang with us and talk hoops. We asked her if, just for old time's sake, she'd break out the pencils and markers. Our old college basketball writer slash new (new-ish) food and travel writer couldn't resist. It was a thing of beauty: Marcus finalizing his bracket at his keyboard, a safe distance from any writing utensils, and Amelia a few feet away, chuckling at her own randomness. "I think I blacked out for a little bit," she said as she realized a team she only kinda-sorta likes made her Final Four. So we get the best of both worlds this year: Marcus analyzing every game and every scenario, and Amelia artfully crafting her off-the-cuff picks. And they'll both probably lose to your aunt who picks teams based on the scariness of their mascot.